This staggeringly beautiful 162-hectare estate, nestled in the Jonkershoek Valley, is located only 5 minutes from the centre of town, and was founded in 1692, which makes it the third oldest farm in the area. 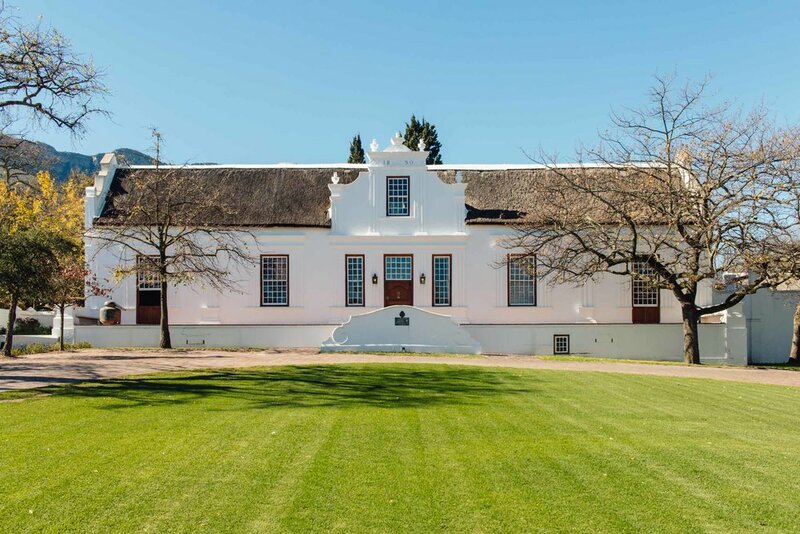 Lanzerac’s compelling history tells the tale of several ambitious and passionate proprietors throughout the centuries - its current benefactor acquired the land in 2012, and has ushered in a new era of contemporary upgrades with a vision of sustaining the legacy of this grand property. There are 53 individually styled rooms, housed in several buildings spread across the sprawling green gardens. All four category accommodations offer an unsurpassed level of comfort, spaciousness and privacy, whilst the larger suites boast private splash pools and lavish living areas. After a tragic fire destroyed the main operating areas of the hotel in May 2017, the entire property underwent an extensive and painstaking year-long refurbishment. Now, the striking results of this massive project are evident in the scrupulous attention to detail, quality craftsmanship and careful consideration of Lanzerac’s heritage, which all reflect in the new design. My gorgeous suite formed part of “Brown’s Cottage” - a secluded refuge positioned on the periphery of the magical gardens and vineyards, with dramatic views of the distant mountains. Its exquisite interior featured befitting wooden window shutters, specially selected antiques, art and period pieces, all harmoniously integrated with contemporary conveniences like underfloor heating, mood lighting and air conditioning. It was like stepping back in time without compromising on today’s vital modern luxuries. Aside from a Nespresso machine and complimentary select minibar, a variety of delicious local snacks awaited on the coffee table. The suite’s large classic marble bathroom showed off with imported Victorian accessories by St. James, and subtle rustic touches like exposed stone walls, tied together by glamorous gild-framed mirrors and beaming crystal light fittings. Despite the recent drought in the Cape, Lanzerac makes use of their own off-the-grid water source, which means guests can enjoy a relaxing bubble bath without any compunction… Another ingenious part of my room was the separate upstairs TV lounge, with homely sofas and seating - perfect for the ultimate movie night. Furthermore, the private pool and patio was ideal to unwind and appreciate the picturesque nature, which is truly all-encompassing. Lanzerac is an absolute epicure’s delight, with no less than four restaurants where patrons can savour incredible cuisine prepared with locally sourced ingredients. The Manor Kitchen, an elegant double volume space flooded with natural light, is the hotel’s signature eatery. For breakfast, a comprehensive buffet as well as inventive à la carte options are served, which is included in the daily room rate. At night, it seamlessly transforms into a chic fine dining establishment, which sets the stage for an intimate meal, expertly paired with the estate’s various award-winning wines. The kitchen is fully visible behind large floor-to-ceiling sash windows, allowing diners the opportunity to admire Lanzerac’s team of chefs at work - this purposeful design devises an ingenious interactive experience. For a casual repast, the rustic gastro-pub environment of Taphuis, which comprises traditional wooden furniture, a salvaged antique bar and cobbled floor, is the ideal spot for a tipple and sharing some tapas. The enormous open fireplace creates a hearty atmosphere, where visitors can enjoy delightful fare like springbok bobotie and Cape spice and ginger beer battered hake bites. 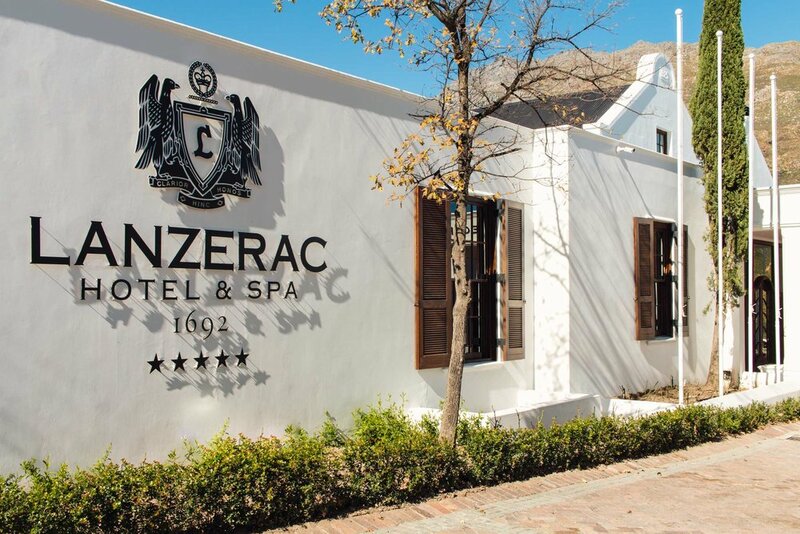 Finally, there is the popular Lanzerac Deli, set amongst vineyards and ancient trees, here gourmands can admire the endless vistas from the terrace, whilst sipping on one of their famed cappuccinos. You can indulge in a mouthwatering variety of artisan baked goods like pastries, breads, sandwiches and scones, as well as their all-day breakfast. In addition, the delicatessen also produces and sells an assortment of divine homemade preserves, which make for great gifts or mementos to take home. Appropriately, this renowned estate extends the use of several leisure facilities to its visitors and guests. It’s no wonder that the hotel’s upscale Spa is lauded as one of the trendiest in the Stellenbosch area. With its expertly composed menu of treatments and highly trained therapists, spa-goers are literally in the best of hands. There are seven state-of-the-art therapy rooms located on the top floor, and other amenities include manicure and pedicure stations, a private relaxation lounge, a sauna, steam room, experience shower, mist room, and fully-equipped fitness room. My favorite part of this swanky sanctum was the lavish indoor heated pool and jacuzzi, which both overlook the marvelous mountain scenery. Moreover, another three outdoor swimming pools (apart from the four private ones) are for guests’ exclusive use, all concealed in different parts of the mystical grounds. Here you can lounge around in the open air, and I recommend doing so with a bottle of Lanzerac’s luscious Blanc de Blancs Brut. After the recent renovation, led by project coordinator and designer Con van der Colff, the hotel now boasts a considerable amount of conference and banqueting space. There are several venues - from individually styled boardrooms (each varying in theme) to the much larger grand Cellar Hall. Whatever the occasion, Lanzerac will certainly add a sense of sophistication and prestige to any type of function held in one of their remarkable event premises. Undoubtedly, Lanzerac’s biggest drawcard is the phenomenal wines produced by the estate. The first vines were planted here by the farm’s original owner over 300 years ago, and his successors continued to expand by acquiring additional land. Today, the domain brags over 100 hectares of vineyards, and its current collection includes three ranges, featuring 15 distinct wines. Lanzerac is also known as the birthplace of Pinotage - Abraham lzak Perold formulating the world’s first Pinotage grape varietal on the property in 1925, and it was originally bottled in 1959. Needless to say, the cellar’s current Pionier Pinotage is favorably appraised, and simply sensational! All hotel guests are treated to a premier wine experience, which includes a complimentary tasting in the country style Tasting Room, followed by a tour of the working cellar. For me, honest and genuine hospitality is indubitably what brings about an unforgettable hotel stay. Generally, new property openings and relaunches have their initial operational issues - however, these can be easily forgotten when employees are confident and passionate about their craft, ultimately putting guests at ease. This is the case with the revamped Lanzerac. From front-of-house and dining, to spa and housekeeping staff - every member of the team plays their part with alacrity and intuition, not compromising on the hotel’s ethos of country warmth. It is this particular style of sincere service that makes me feel most at home. Prior to my arrival, I was well aware of Lanzerac’s distinguished reputation as a revered winery and desirable leisure destination. Of course, my hopes were high that it would live up to this good name. As I passed through the white washed gates, my anticipation was subtly replaced by something unexpected… a reimposed calm that completely enveloped me. This special site of historic grandeur, confined by pristine natural environment and meticulously cared for by its gracious custodians, has the mysterious ability to make one transcend into a sense of total tranquility. That is true luxury. * I was kindly invited by Eclipse PR and my stay was partly complimentary. Hey, I'm Horak! I write about luxury hotels, amazing food & unique travel experiences. Get updates on my travels! Traverate will never send you spam or share your details with 3rd parties.